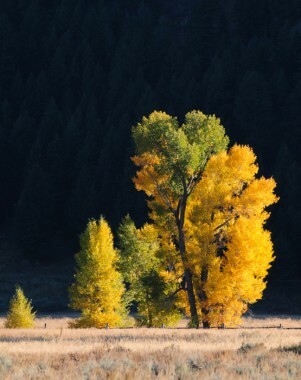 The light during the fall in Jackson Hole is particularly magical; especially in the few golden hours of early morning and early evening. In this impression I caught the late afternoon sun lighting up this row of trees against the dark backdrop of a wooded mountain already in the shadows. The glowing contrast created a dramatic visual feast for eyes to see, spirit to behold and camera to translate. A prime example of a simple, but stirring impression of renewal there to be discovered with the right combination of light, color and emotion in this peaceful place during this special season.